The Australian Government Department of Veterans’ Affairs (DVA) funds an ongoing health promotion based program to improve use of medicines and related health services, which implements interventions that include audit and feedback in the form of patient-specific feedback generated from administrative claims records. We aimed to determine changes in medicine use as a result of the program. The program provides targeted patient-specific feedback to medical practitioners. The feedback is supported with educational material developed by a clinical panel, subject to peer review and overseen by a national editorial committee. Veterans who meet target criteria also receive educational brochures. The program is supported by a national call centre and ongoing national consultation. Segmented regression analyses (interrupted time series) were undertaken to assess changes in medication use in targeted veterans pre and post each intervention. 12 interventions were included; three to increase medicine use, seven which aimed to reduce use, and two which had combination of messages to change use. All programs that aimed to increase medicine use were effective, with relative effect sizes at the time of the intervention ranging from 1% to 8%. Mixed results were seen with programs aiming to reduce inappropriate medicine use. Highly specific programs were effective, with relative effect sizes at the time of the intervention of 10% decline in use of NSAIDs in high risk groups and 14% decline in use of antipsychotics in dementia. Interventions targeting combinations of medicines, including medicine interactions and potentially inappropriate medicines in the elderly did not change practice significantly. Interventions with combinations of messages targeting multiple components of practice had an impact on one component, but not all components targeted. The Veterans’ MATES program showed positive practice change over time, with interventions increasing use of appropriate medicines where under-use was evident and reduced use of inappropriate medicines when single medicines were targeted. Combinations of messages were less effective, suggesting specific messages focusing on single medicines are required to maximise effect. The program provides a model that could be replicated in other settings. The difficulty in translating research findings to the practice setting has been well described [1, 2], particularly in the area of medicines use. Under-prescribing of effective medicines is common, as is use of too much medicine, use of the wrong drug, and use of an inappropriate medicine regimen [3, 4]. Bridging the evidence-practice gap in the area of medicines-related health care is critical because medicines are the most commonly used health care intervention , and there is a significant gap between existing evidence and practice in relation to medicine use . Implementation research provides evidence to guide the design of quality improvement programs, which can promote the translation of research findings to practice and improve the use of medicines, patient care, and health outcomes . Audit and feedback are often promoted to improve use of medicines; however, systematic reviews of interventions to improve uptake of evidence in practice have found mixed success [1, 7]. A systematic review of randomized controlled trials of audit and feedback found that some interventions were associated with a large increase in adherence to practice guidelines, while others had a negative effect ; the median relative percentage practice improvement was 8 percent, with the adjusted risk ratio varying from 0.7 to 18 across studies . The duration of effect following intervention also varied, with improvements in practice seen in some studies at up to six months follow-up, while in other studies there was no difference between intervention and control groups at three weeks post intervention . Some studies found no difference between intervention and control groups at any point of time during follow-up . Audit and feedback interventions were more likely to have an effect when baseline adherence to the targeted treatment guideline was low, however, the effect was still modest . This may be because many implementation studies do not consider communication, behavioral, and health promotion theories in their design. One review of guideline implementation studies found that less than 10 percent of studies identified the theoretical rationale underpinning the intervention . While results vary, collectively, the evidence suggests audit and feedback is effective. From an implementation science perspective, the next research question becomes how to implement audit and feedback routinely as part of ongoing routine health-care improvement. 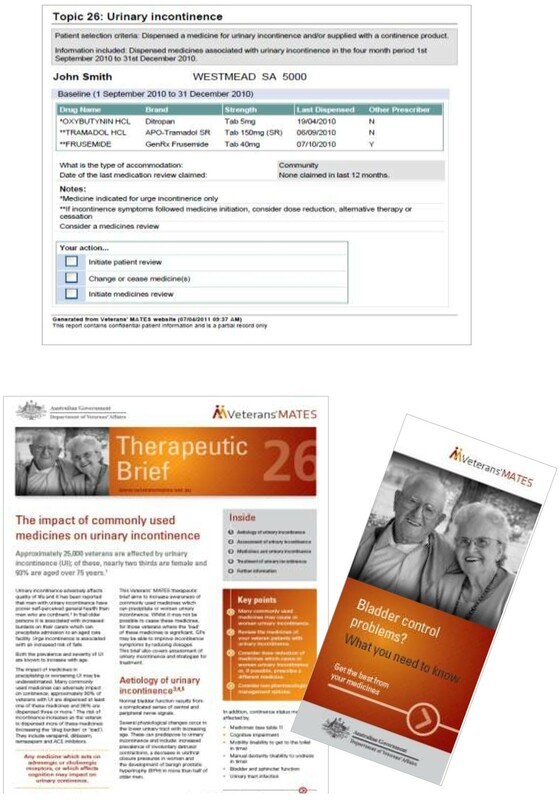 In this paper we report the results of an ongoing health promotion–based quality improvement program that uses audit and feedback in the form of patient specific feedback generated from administrative claims data to improve use of medicines in the elderly Australian war veteran population. Since 2004, the Australian Government Department of Veterans’ Affairs (DVA) has funded a quality improvement program, the Veterans’ Medicines Advice and Therapeutics Education Services (Veterans’ MATES) program [8, 9], to bridge the evidence-practice gap in the provision of health care to Australian war veterans. The overall aim of this paper is to determine changes in medicine use as a result of the program. The Veterans’ MATES program aims to improve medication use and health outcomes for all persons in the veteran community by delivering interventions to general practitioners (GPs), pharmacists, and veterans. Social cognitive theory [10, 11], the transtheoretical model [12, 13], and the health promotion model Precede-Proceed  were used as the theoretical frameworks that underpinned the program and were used to predict learning and behaviour change (Figure 1). 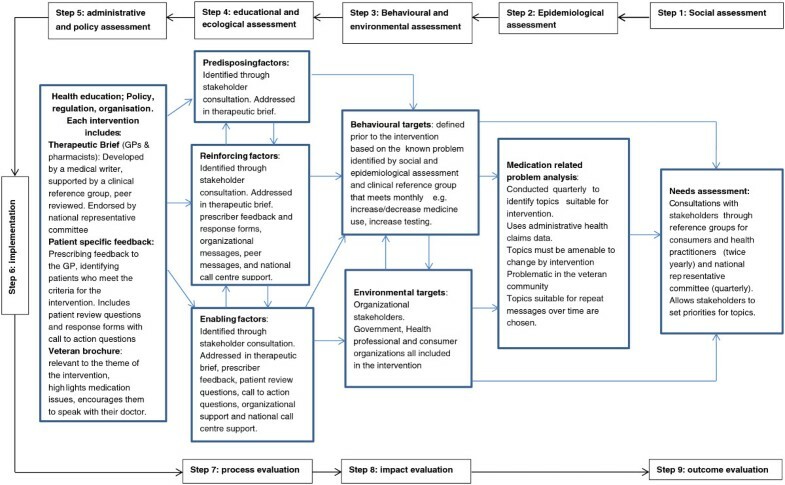 Key features of the implementation design included the ability to provide routine periodic interventions with ongoing evaluation suitable for participation by all practitioners (Figure 1). The main intervention was patient-specific feedback that identified for GPs their patients with potential medication-related problems. The feedback included a list of the patient’s relevant medicines, contained notes identifying the potential problems, and included tick boxes for GPs to indicate the actions they would take in response to the information, including the need for a review of the patient’s therapy (Figure 2). Supportive educational material was also provided that included advice to assist the GP in resolving the potential medication-related problem. In addition, the veterans identified in the GP mailing were mailed an educational brochure highlighting potential medication issues related to the topic and encouraging the veterans to speak with their doctor. The same educational material was also provided to all pharmacies and accredited pharmacists to enable pharmacists to support the practice change (Figure 2). The program was implemented four times per year. Mailings were delivered only to those GPs and veterans who met the criteria for each program and to all pharmacies and accredited pharmacists. Between November 2004 and September 2008, 16 educational interventions were distributed. Twelve of these interventions focused on changing medication use and are the subject this paper. The aims of the twelve interventions are listed in Table one. Four other interventions focused on health service use, including home medicines review and dose administration aids, and are not reported here. For the interventions, material was mailed first to GPs and pharmacists, with the educational material to veterans provided one month later to enable GPs to read the material prior to the veteran visit. 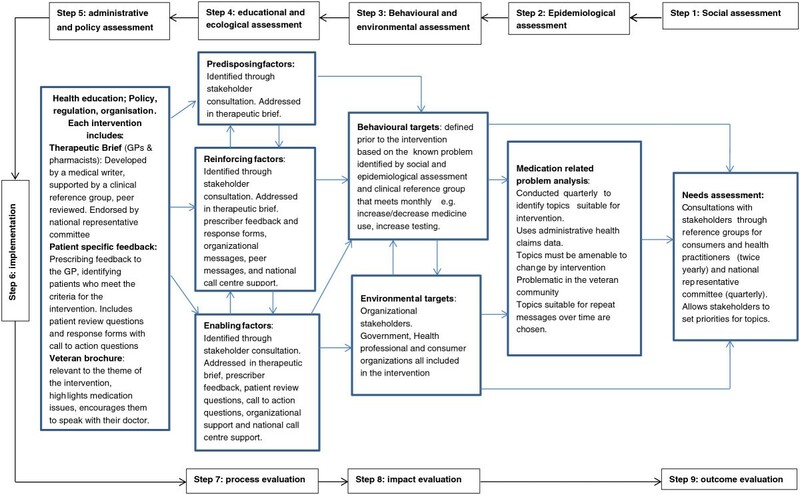 Components of veterans’ MATES interventions, linked to steps in the precede-proceed model. Intervention materials provided for the veterans’ MATES program. In keeping with health promotion principles involving needs assessments and identifying barriers and enablers to change, the program began with nationwide consultation to stakeholder groups, including health professional and consumer organizations (Figure 1). The program also established practitioner and consumer reference groups which meet twice a year to provide advice on topics, interventions, and practitioner and consumer needs. The educational material is developed by a medical writer, supported by a clinical reference group that meets monthly. Prior to publication, the material is peer reviewed and also reviewed by a national representative editorial committee to ensure both the quality of the material and stakeholder support for the material and intervention. The program is further supported by a national call centre staffed by clinical pharmacists who provide educational support, clarify issues, ensure problems are quickly identified, and accept complaints. National consultation with stakeholder organizations and advice from veteran and practitioner reference groups is ongoing (Figure 1). Each educational intervention is based on a specific medicine or health-related topic. To identify topics, the prevalence of medication-related problems is determined using DVA administrative health claims data (Figure 1). In 2004 when the program commenced, there were approximately 320,000 Australian war veterans, war widows, or widowers. Their median age was 80 years; over 40 percent regularly used two or more medicines, and 13 percent regularly used five or more medicines. With veterans aged 70 years and over dispensed an average of 45 prescriptions per year, the population is at high risk of medication-related problems because of their high medication use. DVA health claims data contain details of all DVA subsidized prescription medicines, medical and allied health services, and hospitalizations for veterans. Veterans are entitled to receive all medicines subsidized on Australia’s national pharmaceutical benefits scheme and entitled to receive additional medicines that are subsidized under the Repatriation Pharmaceutical Benefits Scheme. DVA maintains a client file, which includes data on gender, date of birth, date of death, and family status. Medicines are coded in the data set according to the World Health Organization (WHO) anatomical and therapeutic chemical (ATC) classification  and the Schedule of Pharmaceutical Benefits item codes . Hospitalizations are coded according to the WHO International Classification of Diseases . The medication-related problem analyses were generally based within the therapeutic areas outlined in the Australian government National Health Priority Areas (asthma, cardiovascular health, diabetes, mental health, and arthritis and musculoskeletal conditions) . Criteria for each topic were that it was problematic in the veteran community, specific to medication or health service management, amenable to change by the interventions employed by the Veterans’ MATES program, and able to be evaluated using DVA administrative data sets. In addition, the topics chosen were suitable for repeat messages over time, to increase the persuasiveness of the messages . In developing the intervention, strategies consistent with behavioural theories were established. Every educational intervention included strategies to raise awareness, improve knowledge, and encourage trial of appropriate behaviours. Each intervention included objectives to provide useful information to participants; to increase GPs’ knowledge of the veterans they treat who meet the target criteria for the intervention; and to change medication or health service use in line with the messages of the educational intervention. GPs and pharmacists could claim professional development points for participating. This provided an incentive for GPs and pharmacists as professional development reports are required for maintaining practicing certificates. Table 1 provides the final list of interventions and target groups. 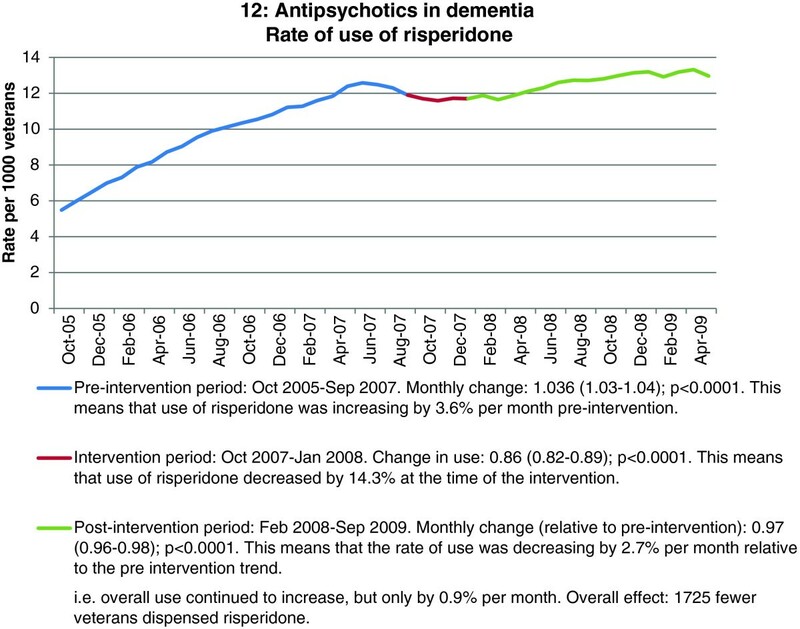 To reduce antipsychotic use for behavioural and psychological symptoms of dementia (in those aged over 65 years). Veterans aged >65 years dispensed oral antipsychotic medicines. To improve use of medicines for constipation; specifically, to increase the use of osmotic and bulk laxatives and reduce the use of contact laxatives. *Material was not mailed to veterans. For this topic, materials were provided to the GPs treating these 6990 patients to pass on to the patient if appropriate. NSAID, non-steroidal anti-inflammatory drug; PPI, proton pump inhibitor; GORD, gastro-oesophageal reflux disease; COPD, chronic obstructive pulmonary disease. Stakeholder satisfaction was evaluated for all interventions using a one-page reply paid response form that was mailed with the educational materials. The evaluation forms were designed to minimize additional workloads for busy health professionals, thus, the forms were limited to no more than nine questions (one page) and all answers required a “tick-box” response only. Evaluation forms were created for every intervention with questions relevant to the targeted topic. Specific forms were created for GPs, pharmacists, and veterans. All targeted participants were mailed the evaluation forms. No follow-up reminders were sent. The response forms included questions on the usefulness of the educational material, as well as likely actions to be taken as a result of the program. Three months after each intervention, responses were collated. Individuals could only respond once for each intervention but could respond to multiple interventions if they had been targeted in more than one intervention. Segmented regression analysis was used to estimate the effect of each intervention on medicine utilisation taking into account the baseline trend prior to the intervention . A log-binomial generalised estimating equation was used with an ar (1) error structure to account for correlation between months, clustered by patient. The models included a constant term, a term for baseline trend prior to the intervention, an indicator term to estimate the change in level at the time of the intervention and a post-intervention trend term to determine the sustainability of the intervention over time. We calculated the number of people estimated to have changed behaviour as a result of each intervention based on the number of veterans targeted at the time of the intervention, the level change at the time of the intervention plus the monthly trend change at the time after the intervention compared to the pre-intervention trend over the 24 month period. The time periods used for the analysis were as follows: the pre intervention period was the 24 months prior to the month of mail out for each intervention, the intervention period was the four months immediately following the month of mail out, and the post-intervention period was the subsequent 20 months (i.e. month 5 to 24 post mail-out). All analyses were undertaken using SAS for windows, V9.1.3 SP4 (SAS Institute, Cary, North Carolina, USA). Ethics approval for the study was obtained from the Department of Veterans’ Affairs Human Research Ethics Committee (reference number: E004/016) and the University of South Australia Human Research Ethics Committee (reference number: P203/04). The twelve interventions implemented had an average target group size for each intervention of 33,000 veterans, 10,000 doctors, and 8500 pharmacies/accredited pharmacists. The target group size and aim of each individual intervention is listed in Table 1. Of the three interventions that aimed to increase medicine use, all achieved statistically significant increases at the time of the intervention. However, all post-intervention trends, while remaining positive, were lower than the pre-intervention trend (Table 2 and Figure 3). Estimated numbers of patients with sustained behaviour change over the subsequent 24 months as a result of the intervention ranged from 642 to 3234 per intervention. ACE inhibitor, angiotensin converting enzyme inhibitor. Example of an intervention aiming to increase medicine use. Of the seven interventions that aimed to reduce use, the three that targeted one specific medicine to be reduced, NSAID use in those with heart failure or diabetes, high dose proton pump inhibitor (PPI) use, and antipsychotic use in those aged over 65, all achieved significant level changes at the time of the intervention, ranging from 10% to 14% (Table 3 and Figure 4). For proton pump inhibitors and antipsychotics, the impact was increased over the 20 month follow-up period as evidenced by the statistically significant further reduction in the trends post intervention compared to pre-intervention trends (Table 3). The estimated number of patients with sustained behaviour change over 24 months ranged from 780 to 1725 for the three interventions. By comparison, the four interventions to reduce use that had multiple messages, medicine interactions (antidepressant interactions), potentially inappropriate medicines in those aged over 70 and respiratory device use did not show significant effects. Pre-intervention trends, which in most cases were falling, continued to fall. Duplicate antidepressant use was the exception, where usage increased despite messages that duplicate use was not appropriate. The two interventions that targeted multiple respiratory device use for those on four or more different devices only reduced post intervention, but not at the time of the intervention (Table 3). Example of an intervention aiming to reduce medicine use. Table 4 demonstrates the results of two interventions that had combined messages to increase one aspect of medicine use and decrease another. Significant changes were seen in keeping with intervention messages for clopidogrel at the time of the intervention with increased aspirin use and reduced NSAID use; subsequent trends remained unchanged. By contrast, laxative use did not change at the time of the intervention, but subsequent trends were statistically significant in keeping with intervention messages. The stakeholder evaluations for each intervention had a median response rate of 8% (interquartile range 7%-10%) for GPs, 9% (7%-9%) for pharmacists and 26% (24%-32%) for veterans. On average, 80% of GPs and 93% of pharmacists who completed the stakeholder evaluation found the interventions useful or very useful (Table 5). On average, 80% of veterans who completed the stakeholder evaluation found the information provided helpful or very helpful (Table 5). #Percent of GPs, veterans or pharmacists who provided feedback. *No feedback was sought from pharmacists for intervention 2 or from veterans for intervention 12. In our study, all educational interventions aiming to increase medicine use were effective, with relative effect sizes ranging from 1% to 8% at the time of the intervention. However, all of the interventions also had a statistically significant effect on the post-intervention trend which was reduced compared to the pre-intervention trend. The reduced trend observed after the intervention could be due to the reduced naïve patient pool which results as a direct consequence of the immediate impact of the intervention. It also suggests that the effect of interventions to increase use of medicines may not be sustained and would require repeat messages over time to be sustained. Educational interventions aiming to reduce unnecessary use of medicines had mixed results. Those with very specific messages (reduce use of non-steroidal anti-inflammatory agents in high risk patients; reduce use of high dose proton pump inhibitors; and reduce use of risperidone for the behavioural and psychological symptoms of dementia) were all effective, with relative effect sizes up to 14%. Educational interventions with more generic adverse event messages (avoid antidepressant interactions, reduce potentially inappropriate medicine use in the elderly) had no measurable effect on practice. Interventions less clearly linked to patient harm or poor health outcomes and with combinations of messages, such as those to reduce use of multiple inhaler devices, and improve the use of medicines for constipation were associated with practice change in some but not all aspects of care and were often found to be statistically significant in the post-intervention trend only, not at the time of the intervention. It is likely that the combination of messages meant these interventions were less effective. The evaluation of these interventions may also have been confounded by patient practice, where these medicines may be used “as required” and thus change in dispensing quantities may be delayed, hence the positive effect in the post-intervention trend only. The relative effect of our results, which ranged between 1% and 14%, is consistent with the median relative effect reported in the Cochrane review of audit and feedback of 8%7. Our results suggest well implemented, behaviourally grounded, ongoing programs do achieve similar results to randomised control results. The Veterans’ MATES program is a national program, targeting all general practitioners in Australia. Thus, the program requires sustained engagement of participants to maintain its success. The outcomes reported here demonstrate a bridging of existing evidence-practice gaps in diverse therapeutic areas. The behavioural intervention, utilising patient-specific prescriber feedback, is based on evidence from randomised controlled trials . The implementation and evaluation frameworks were based on behavioural theories and have enabled implementation of evidence in practice. The significance of this work lies in its ability to bridge the research-practice gap with an implementation and evaluation framework that enables sustained engagement and demonstration of effectiveness. The changes in medication use reported in this paper are associated with improvements in health outcomes. We have previously shown that PPI use in the Australian veteran population was associated with increased use of antibiotics (RR 1.23, 95% CI 1.21–1.24) and increased risk of hospitalisation for pneumonia (RR 1.16, 95% CI 1.11–1.22) . We have demonstrated increased risk of hospitalisation associated with use of NSAIDs amongst veterans with diabetes (IRR 1.31, 95% CI 1.08 – 1.60) and veterans dispensed medicines indicative of heart failure (IRR 1.34, 95% CI 1.13 – 1.58) . We have also demonstrated increased risk of death, stroke, hip fracture and pneumonia with antipsychotic use in the elderly veteran population [23–25]. 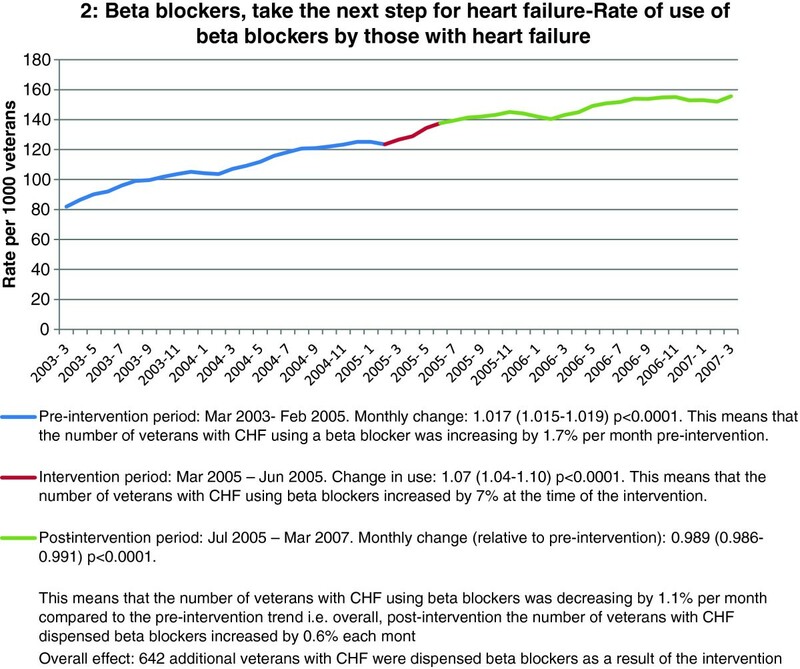 We also demonstrated that beta-blocker use was associated with less hospitalisations for heart failure in elderly veterans . 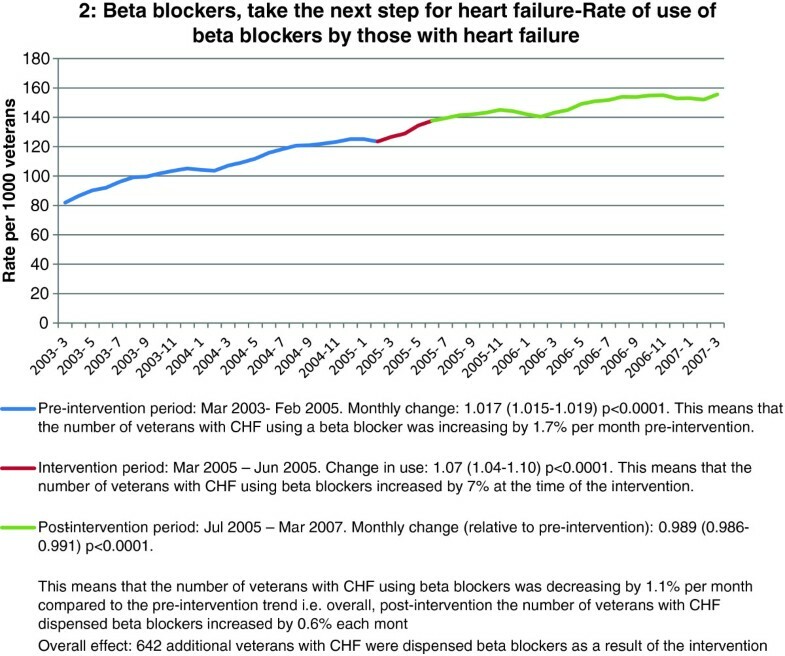 The Veterans’ MATES program was associated with declines in use of proton pump inhibitors, reducing NSAID use, reducing antipsychotic use and increasing beta-blocker use in those with heart failure, all suggesting health outcomes for veterans have improved. The implementation of the Veterans’ MATES program includes all the elements identified within the National Institute for Clinical Excellence Principles of Best Practice for Clinical Audit  and is consistent with the behavioural theories, particularly the Precede-Proceed Model of Health Promotion  and Social Cognitive Theory  which identify the need for developing supportive environments, raising awareness, developing knowledge and skills, encouraging cognitive processing of the information and reinforcing messages over time. Creating an environment conducive to change is achieved via stakeholder support and involvement, which is an ongoing component of the program, achieved through twice yearly meetings of the practitioner and veteran reference groups, quarterly meetings with the national representative steering committee and regular attendance at health professional meetings. Face-to face meetings are called as required with national bodies for selected topics. Topic selection is always based on an identified medication-related problem, where data analysis has revealed a problem which is amenable to intervention by audit and feedback and which has the support of the clinical reference group and stakeholders. Problems which are not measureable in the data are not implemented under this program. An intervention plan is developed which includes clear objectives, the strategies to meet each objective and process impact and outcome indicators for evaluation. This plan is endorsed by all groups for each intervention. The material includes call to action questions to promote cognitive processing. Stakeholder feedback through our reference groups, call centre, e-mail comments line and one-page response forms identify both barriers and enablers to continue to improve the program. The evaluation results are routinely fed-back to all reference groups and inform the ongoing interventions. Further, the ongoing nature of the program enables repeat messages over time. While it could be argued that programs such as this should be evaluated using more rigorous methods, such as randomized controlled designs, we advocate that this program represents true implementation science. Previous randomized controlled trial data have demonstrated the efficacy of audit and feedback. Similarly, randomized controlled trial data were available for all Veterans’ MATES interventions targeting medicine efficacy and either randomised controlled trial or well conducted observational evidence is available for all medicine safety issues targeted. For this reason, this program sought to implement the evidence, and as a consequence used health program evaluation methods for the analysis. For this reason, we are limited to methods of evaluation such as time series or non-equivalent groups. As this program was a national program, for the majority of interventions no comparison group was able to be selected, thus time-series was the method used. A further challenge in evaluating ongoing programs are the occurrence of simultaneous interventions, or interventions immediately prior or after which may impact on the evalution and lead to over-estimates or under-estimates of results. This may occur due to changes in co-payments, product withdrawals, changes to subsidy and changes in safety or efficacy or indications. While at times these environmental changes may obscure intervention effects, well targeted programs can take advantage of these opportunities to enhance intervention effect, for example by reinforcing safety messages and giving clear advice on what to use instead. The consistency of our results, in terms of relative effect size, across a range of topics and the consistency of that effect with existing studies using controlled designs  suggests our evaluation is likely to be estimating true effect. We have demonstrated that a well designed program using proven techniques from implementation research, designed with local characteristics in mind and in consultation with key stakeholders can be effective. The Australian medicines and health environment has been exposed to a formal National Medicines Policy for a decade . This policy initiative has funded national quality use of medicines programs, for example the National Prescribing Service, which has been in operation for about 10 years. While this environment may predispose both health practitioners and consumers to be favourable to the types of interventions implemented by the Veterans’ MATES program, the practice changes reported in this paper are over-and-above those that have been achieved through these other policy initiatives [30–32]. The Veterans’ MATES program has been successful in achieving positive, significant changes in medicines and health service use over time. Educational interventions with a clear, single message tended to be most successful in changing practice as were those which aimed to increase use. The Veterans’ MATES program provides a model that could be replicated in other settings such as a national health service or a health insurance organisation where bridging the evidence-practice gap is proving a significant challenge. The research was funded by the Australian Government Department of Veterans’ Affairs (DVA) as part of the delivery of the Veterans’ Medicines Advice and Therapeutics Education Services (Veterans’ MATES) project. Veterans’ MATES is provided by the University of South Australia, Quality Use of Medicines and Pharmacy Research Centre, in association with Discipline of General Practice, The University of Adelaide; Discipline of Public Health, The University of Adelaide; Repatriation General Hospital, Daw Park; NPS – Better choices, Better health; Australian Medicines Handbook; and the Drug and Therapeutics Information Service. EER conceived of and designed the study, participated in data analysis and drafted the manuscript. LKE participated in data analysis and drafted the manuscript. ENR and NP performed the data and statistical analyses and assisted in study design and drafting of the manuscript. JB participated in data analysis and critically revised the manuscript for important intellectual content. VL, PR, RP, and GK assisted in study design and critically revised the manuscript for important intellectual content. AG conceived of and designed the study, and critically revised the manuscript for important intellectual content. All authors read and approved the final manuscript.